If you ever visit Planet Hollywood or Caesar’s Palace, don’t forget to look up; you’ll experience the thrill of a GFRC ceiling by Stromberg. Stromberg provides the world’s highest quality ceilings, coupled with the largest selection of exciting designs to complete the space where you work or play. The ceiling in your home or business plays a major role in defining the area and giving it personality. Ceilings made of glass fiber reinforced concrete (GFRC) will bring definition to your space, making your guests feel welcome and inviting them to stay awhile. 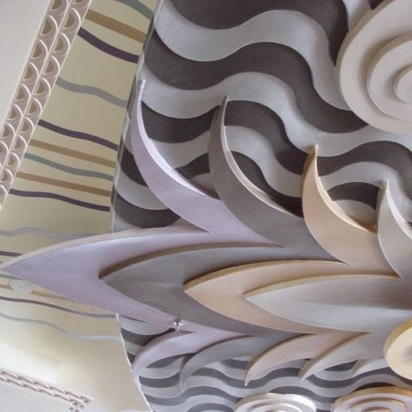 Stromberg ceilings come in a wide variety of colors, textures and finishes, and Stromberg can add abstract or stylized designs in a variety of materials to make your ceiling a true work of art. Whether formal or informal, a GFRC ceiling by Stromberg will go a long way in first class flair at a reasonable price. Choosing a glass fiber reinforced ceiling from Stromberg is a wise investment in your home or business. Stromberg has crafted exquisite GFRC ceilings for such places as Mirage Casino and Atlantis Resort as well as Caesars Palace and Planet Hollywood. They can integrate your vision with their custom designs and quality workmanship; the final result will be truly stunning. Stromberg provides you with a complimentary initial consultation, estimates and the best service and value in the industry. Stromberg pioneered the use of GFRC, and their use of molds means you’ll have a wider choice of ceiling designs. They take pride in their work and it will be evident in the energy their custom ceilings will bring to your room. GFRC is lightweight; it’s reinforced with glass fibers instead of steel, making it a smart choice for your custom ceiling. GFRC is a versatile and attractive material. GFRC is fire-retardant and rust proof; your ceiling will be functional and stand the test of time. GFRC ceilings come in a variety of custom designs and are easy to install. Choose the accomplished experts at Stromberg Architectural Products; they’ll work closely with you every step of the way to ensure your GFRC ceiling is exactly as you envisioned. Stromberg is here to help with CAD details, design assistance and all specifications. Contact them today at (903) 454-0904 for your free custom quote, and put their 30 years of talent and imagination to work for you.